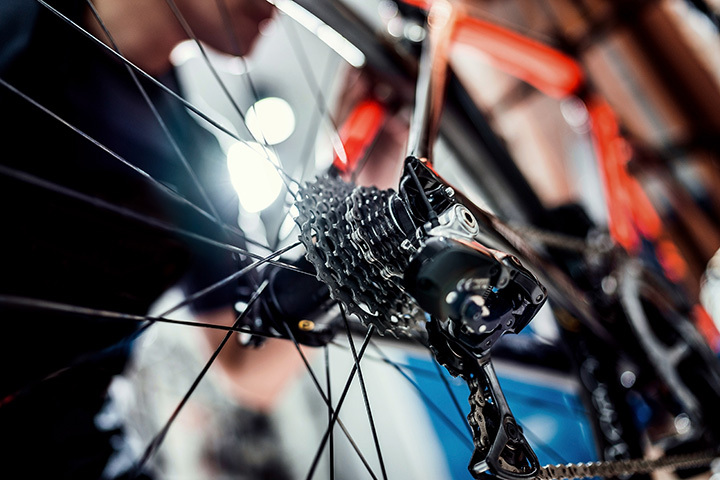 Casual rider, cyclist or daring bike expert, bike shops are your go-to stop for bicycle repairs, add-ons or even a new bike. In the state of North Carolina, bike shops big and small are here to serve you with friendly service. Here are the 10 best bike shops in North Carolina that are off the chain and ready to revamp your bike or to help you purchase a new beauty to ride! Locally owned, Bullseye Bicycle is open Monday through Saturday from 10 a.m. until 7 p.m. and on Sunday from 12 p.m. to 5 p.m. Bullseye offers inexpensive bikes, bicycle repairs that are quick and reasonably priced, and a knowledgeable, friendly staff to answer any questions you may have. In the chill environment of Bullseye Bicycle, feel free to explore the shop and enjoy a chat. Bicycle Gallery is an independent shop of experts to get the kiddo the bike that will make memories or to get you back on the bike—even if it’s been a few years. In search for a bike to tackle the mountains, cruise the beach in style, workout or just ride the block, Bicycle Gallery has plenty of bike options for you to choose from! If you want to bike with the groups, join Bicycle Gallery Tuesdays and Thursdays at 6 p.m. or on Saturdays at 8 a.m. to enjoy the ride. Have a bike that needs a repair? Bicycle Gallery provides a free estimate when you bring the bike in and offers inexpensive service packages to fix your bike up! Open since 2007, Back Alley Bikes is dedicated to sharing their love of bikes. The staff at Back Alley Bikes are friendly and helpful to providing you with the knowledge you need to pick out your new bike or bike accessories or to assist in fixing up your bike. Located in Carrboro, Back Alley Bikes is the place for honest, low pressure service. Uptown Cycles of Charlotte, North Carolina, offers bicycle rental, and sales, and bike service and repair. This one-stop shop is a phenomenal experience for experienced riders and newbies alike. Patient, helpful staff are in and ready to answer the questions cycling through your head. Located in Pisgah Forest, rent a bike, buy a bike, or have your bike fixed. If your bike needs some expert TLC or you wish to rent a mountain or road bike for an afternoon cycle, Sycamore Cycles offers it all. Wanting to interact with fellow cyclists? Participate in the weekly group rides. The “Hendersonville Road Ride” on Mondays starts on location at 6 p.m. for those wanting an easygoing adventure! On Tuesdays at 6 p.m., join other riders at the Ingles Store for an approximate 25-mile ride. Wednesdays, take a slightly challenging ride in one of the two groups at 5 p.m. or 5:30 p.m. And on Saturdays, take the easygoing morning ride during the summer at 8 a.m.
Open for over 20 years, Carolina Fatz relaunched in 2014 to provide customers with the best of the best selection and fast, efficient service that will leave a good taste on your mouth. You may be searching for a leisure bike or a mountain bike and Carolina Fatz can help! Regardless of why you walked in the door, you receive outstanding, personable service and if you need a bit more information, you will leave satisfied. Revolution Cycles started a revolution you are sure to want to join. You are provided with bike services – maintenances and repairs of any volume, bike rentals if you are in Greensboro and ready to explore, bikes for any riding need, and apparel to rock as your ride. Come in for a relaxed, positive experience. Rent, have your bike repaired, a bike fitting or cycle out with a new ride or accessory at the Bike Cycles of Wilmington. Here, the staff provides the best service for you and to share the love for biking. Open Monday through Saturday from 10 a.m. through 6 p.m., stop by and browse the many popular brands available in store. The high-quality service and the low prices will bring you back for all your biking needs. Oak City Cycling Project is in downtown Raleigh and locally owned to provide new and experienced bike riders alike with the best service and products in the community. Open Monday through Friday from 11 a.m. to 7 p.m. and Saturday from 10 a.m. 5 p.m. choose from a large selection of bikes, and bike products to aid you in your cycling adventures. Open since 2007, Island Hoppers has expanded to provide bikes and bike repairs to the community. Their large product line is equipped for every rider’s needs: tricycles (adults can ride in tricycle style too! ), electric bikes, fat tired bikes, road bike or a beach cruiser as you tour the beach county. Friendly service provides you with a five-star experience and your new or fixed bike to allow you to cycle in style.